LittleTiles Mod 1.12.2 opens up each individual cube that makes up a standard cube of space in Minecraft. So for example a single cube of space in Minecraft contains 4096 tiny cubes. With this mod you’ll be able to make blocks capable of being placed within those tinier spaces. It’s all thanks to the hammer that comes with this mod. With the hammer you can take any block and load it into the interface. From there you can set the size of block you want output from it. So you can make single lines of 16 mini blocks, or full sheets off the side, top or bottom of the block, or if you prefer you can make 1x1x1 cubes for the most precise construction. You can even do any range in between so long as it’s within the 16x16x16 dimensions. There’s a multitude of combinations for this mod and many different applications. You can make custom furniture: Tiny houses, Custom blocks And even pixel art! The greatest part of this is you can pick up your creation after it’s been crafted. All you need to do is shift+right click on your creations with the hammer. Then it becomes a standard item. This is perfect for creative mode because you can create a custom block, break it and then place it infinitely. So much can be done on such a small scale, you only need to use your imagination. 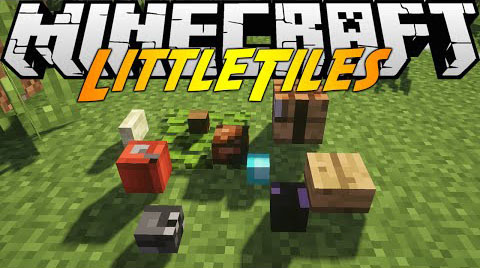 Download the LittleTiles Mod from link below.